Unagi Bowl. It is a popular summer food in Japan. Japanese eat Unagi at Doyo's Ushi Days, happens in July or August. 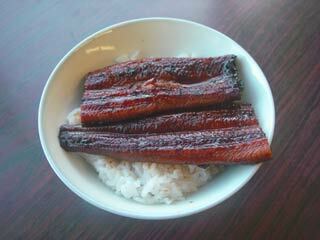 Unagi contains high nutrition which especially good for hot weather. Unagi, Japanese eel is very hard to prepare from the raw fish, therefore we recommend to use a half-cooked Unagi which you can buy it at market. Fist cut it half and put them on a dish. Add small table spoon of Sake. Then, rap them for microwave. Use 500w and heat them for 2 minutes. Let's grill Unagi little with Unagi sauce. Use weak fire. This is the sauce. Use brash and add the sauce. Flip them and add the sauce as well. When the surface is cooked, that's good. Add the sauce on a bowl, too. Put Unagi on a bowl. That's it. Before you eat unagi add Sansho, Japanese pepper. Eat Unagi at Doyo's Ushi Day, and win Japanese summer. Unagi will help you to win Japanese summer.